This is dedicated to the people of note in the One Step From Extenction Universe. Clothing: Nova Terra prison Uniform Inmate #13... but usually wore a leather trench coat, black t-shirt and black denim jeans and pair of tanker combat boots when not wearing his traditional armor of the Concordian Crimson Ghosts. BIO: Stryfe is a man of one name, his origins are a bit sketchy, since some aren't sure how to seperate the myth from the facts. Some say he was a career soldier in both the Dark Fire and latter in the Nova Terra. What facts that have been brought to light is that Stryfe was both a renowned Bounty Hunter and Mercenary - a man who had no loyalty to any nation but himself. Before his career as a mercenary, Stryfe had been a Slicer and Weapons engineer, making a quiet living with a wife and daughter when the war with Nova Terra and Darkfire had engulfed his far off home of Concord Dawn. Life moved on and so did Stryfe. Stryfe is native of Concord Dawn, and as such had been instrumental in turning back the machinated forces of TYCHO and his Steel Plague. Oddly not a heartless stoic, but a flamboyant and even likeable man, for a being responsible for the death of hundreds and having witnessed the death of his people. Now declared an anarchist of the Darkfire nation, Stryfe takes a pleasure in fomenting discord within the empire that has done nothing but cause pain and suffering across the stars. While in prison, Stryfe had befriended the legendary Gaius Marius, a man who is a hero in his nation. Though both have their own ideals, while in prison they became fast friends when other Darkfire prisoners attempted to kill the legendary hero during a riot. Stryfe is a man of some honor, though he has the mind of calculating killer and has no qualms in taking life. He doesn't dwell on the past and only lives in the here and now, seeing vengeance as futile means of existence. Apart from understanding of almost all weapon systems, terrorist tactics, tracking, piloting crafts and arming and even making explosives. Stryfe is a man who can make use of what he has, and having spent time in prison and various penel colonies, Stryfe has made a living learning and killing. Self reliants and calculating, Stryfe combines cunning, guile and violence to achieve his ends. Stryfe is a solider who has endured so much and has fought across the stars and various worlds. As a true son of Mars and a descendant of Rome, Marius adopted the name of the Roman who reformed the Legions into the best military Earth had seen up to that time. He vowed upon the death of his father to reclaim the honor of the new Romans and drive off the Darkfire spawn of evil. 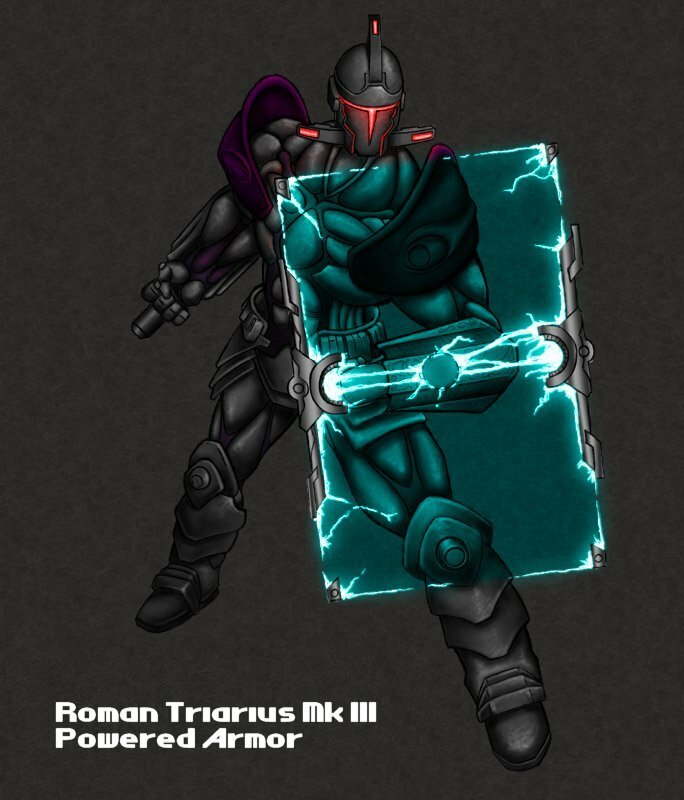 Before the Darkfire invasion Marius was the Legati Legionis (Division Commander) of the Equites Singulari Augusti (Imperial Horse Guard) armored Legion. He was the commander of the Nova Terran ground forces in the fight against the Darkfire. It was his skillfull handling of the Nova Terran forces that caused the invasion to drag on for years insted of the months the Darkfire Empire had planned on. The resistance of the Nova Terrans consumed a good 10% of the Darkfire military resources, and probably the reason why the independant planets still remain independant. But the outcome of the invasion was never in doubt, without intervention by the Empire of Earth there was no chance for the Nova Terrans to hold off the vast military of the Darkfire. And the non-intervention of the Earth Empire doomed the Nova Terrans to conquest and enslavement. His specialty is ground and guerilla warfare. But in his leading of the Nova Terran revolt against the Darkfire required him to learn how to pilot both aerospace and space fighters. He was leading a strike from the Jovian Gas giant, Iuppiter, against the Darkfire Carrier, Eldritch, when he was finally caught. He was jumped by ten Darkfire fighters that had been hiding in the electronic shadow of their carrier in anticipation of this moment. For the Darkfire Empire believed that the capture of Gaius Marius was worth the loss of a carrier. For he had made the Nova Terran system a running sore of death and destruction for them that nothing would be spared to capture him and end his revolt. His wingman and he had killed three of the attackers when one of them kamakazied his wingman and both of them went up in a blue-white flame when the deuterium fuel from both fighters detonated in a spectacular display. The loss of his wingman had shocked Marius to the point of ignoring his six. It was this lack of attention that allowed the Darkfire fighters to damage his fighter to the point of him having to bail out. The Darkfire Empire had used his capture to trumpet their 'superiority' over the Nova Terrans. It backfired on them, especially when the news of what they had lost to capture Marius had hit the streets of Nova Roma, the Nova Terran capital. Because it had inspired the Nova Romans, as they styled themselves, to fight just as hard against the Darkfire Empire as their 'hero' Gaius Marius had done. He was finally dragged off in chains to the prison ship Phoenix. At the time the Nova Romans thought they would ever see him again. As things turned out, they were wrong. Birthplace: Nova Londinium, Capital of the Province Nove Britannia. Rob was born in Kingdom City on one of the last independant planets. When he was 22 he was selected for Officer Training in the Kingom Navy, where he excelled in piloting and infantry combat. It was no surprise then, years later, when he was given command of his first ship, the KSS Red Sea. The ship,a light cruiser, was named after the famous parting of the Red Sea by Moses in the Bible. Religion was not officially required for Kingdom's inhabitants, but was strongly encouraged. He was among the best and brightest of the rapidly shrinking Kingdom Navy, as the war with the Darkfire Empire cost the independant world in men and ships. He was elevated to a planetary hero after his amazing victory over six Darkfire ships, after his ship had been boarded. He took the plasma rifle from a body of a Marine that had fallen on the bridge and killed seven of the Darkfire soldiers himself before the Marines were able to push the attackers out of the bridge. Even after the last ship had been destroyed the fighting still had continued on the ship, and it wasn't until the ship was able to reach port that the remaining Darkfire soldiers hiding on the ship were found. It was a similar situation that got him caught and imprisoned. A fleet of ten Darkfire capital ships, a carrier and two battlecruisers among them, attacked the three Kingdom ships. The other two ships, the Cerberus and Loki, were destroyed by the cruisers, as they concentrated thier plasma fire on the ship while the carrier opened up with a rail cannon. Rob, captaining the Anubis, the oldest battlecruiser in the Kingdom fleet, was to be captured, and as such the Darkfire ships did not fire on his ship. History repeated itself again as boarding craft made thier way to the ship. Missiles and laser fire destroyed most of them, but a few made it in. Hostiles fought thier way to the bridge again, and again Rob was forced to take a weapon from a dead Marine and fight off the Darkfire soldiers again. He killed more than a dozen before an ancient nonlethal weapon, a taser, brought him down to the deck, where he was finally captured. He was to be killed in a public square in the Imperial City, that much he knew. The other prisoners, the ones he saw, had notable figures from other worlds among them. He did a double take when he saw famed Nova Terra hero Gaius Marius among the captured. He was shoved roughly into nearby cell, where he immediately set about plotting his escape. He was never one to give up. Last edited by BOS13 on 07 Jun 2006 13:32, edited 1 time in total. Dieter was born in a small farming village on Kingdom, on the other side of the planet from the capitol. At a young age his village was wiped out by the final revolt on the planet, the one that paved the way for the transition to democracy. Somehow he ended up in the capitol. He joined the Kingdomite Marine Corps when he was sixteen, forging his birth certificate to get in. In the Marines he showed great potential, and was promoted to a squad leader before his twenty-first birthday. When war with the Darkfire Empire was declared he eagerly took the fight to the enemy, killing more than a dozen of the clones in his first engagement with them. When he recieved his commission he was able to introduce an incredibly risky, though brilliant strategy. During a fight between the Kingdomite Light Transport Ull and a Darkfire Light Cruiser he convinced the captain to get in position over the Light Cruiser. All of the ship's missiles launched in a manner to impact simultaneously. When they did they successfully overloaded the Light Cruiser's shields and caused them to fail. Dieter and his company of Marines launched their entry vehicles, and smashed into and through the Cruiser. Luckily, due to the unique design of the drop pods, they actually did punch through the ship's armor instead of splattering thier Marine's on the hull. Taking the clone defenders by surprise, the Kingdomite Marines were able to take the vessel. As the years went by and Dieter advanced in rank, he knew that the Darkfire Empire would have Kingdom very soon. He was in the middle of arranging for his family's evacuation to Earth when a fleet of Darkfire ships gated insystem, lead by the Dreadnought Beelzebub. Dieter's shuttle had just broken from Kingdom and was on it's way to a Heavy Transport when the planet was hit by a Supernova. As the world burned below them the ship continued its ascention. The transport was destroyed as the shuttle neared it, enveloping the smaller craft in debris. The two pilots were killed when the cockpit was breached. Dieter and his Marines, in thier armor, which was capable of operating in a vacuum, were unharmed. Lacking a Beam Drive, Dieter was forced to gather the ships as all of the Kingdomite capital ships burned and the Darkies gated out of system. Escape seemed impossible until the commandeered Darkfire Prison Ship Pheonix gated insystem. Last edited by BOS13 on 01 Jan 2006 01:25, edited 1 time in total. BIO: Cynthia had been a career soldier, rumor has it she was a captain within the Draconis or Dark Fire armies, but had mutined along with a hundred cloners when the order was given to erradicated a group of settlers who weren't a threat to the Empire. The rumor goes she took a Terran blade and drove it into the sternum of her XO and butchered the rest of his body guards. What has been verified is that Cynthia has a strong military background, having served as an honor guard for the immortal emperor himself. She is human, tall, physically built, crafted by both genetic manipulation and her various tours across the stars. She had been sentenced to life imprisonment, told she would go to the Abyss, where she would never see the stars again. Getting to the rock, she had used her influence and had gotten a special 'shine' on her eyes, making her able to see in the dark as well in light. Cynthia is a professional and a predator in her own right. After she busted out of the Abyss, she was recaptured and put on board the Phoenix along with other prisoners. Cynthia has no love nor loyalty left to the Empire which she served and she could care little for the other kingdoms, as now she see's to her survival. But at the moment, Lady Riddick must help the Kingdomite Admiral and his allies escape if she wishes to taste freedom. She will donate her martial prowess to the cause... for now until she see's a chance to escape. Born in the lap of luxury, the Darkfire heir has been accustomed to getting what he wanted, and is never dissapointed. Horatio Darkfire was the only surving relative of the Emperor. His father, the heir of the Empire, had died in a freak accident two years ago when their monorail car collided with another in the Imperial City. The crash left them only mildly injured, but the following plunge killed all involved. Since then Horatio had taken the title of Prince and became the heir apparent to the Darkfire throne. He was put through the Darkfire trianing system for both ground and naval officers, where his father ordered his instructors to grade him for his work, not for his birth. He graduated first in his class in both academies. Through his career in the military he drew some fire from his colleagues for failing to employ what they considered sensible measures. These measures often included the brutal slaughter of civilians and other noncombatants, or indescriminate use of atomic weapons. Though his decisions proved to be morally just, the results provided by these methods were the only thing that allowed him to keep his commands. Over the course of his 30 years, he'd spent a dozen in the military, and already held the ranks of both Fleet Admiral and Field Marshall. Despite his "unorthodox" decisions, he was very popular with his men. He knew whenever he started at a new position his troops would think he got there by virtue of his relation to the Emperor. To disabuse them of that notion he took part in every training exercise conducted by his soldiers, and physically led them in battle. Whether it be on the bridge of a Dreadnought or on foot with a plasma rifle in hand, he was determined to show them he had what it took to lead the Empire's fleets and infantry to victory. His most effective weapon for winning the hearts and minds was his own natural charm and charisma. If he could convince the ranking leader of the opposition to see things his way, the populace generally followed. In the cases they didn't the revolts were fought primarily with further propeganda, and the rebels eventually gave in. He found it was easier to sway the female leaders. Whether because of his good looks or some other intangible factor was beyond his knowledge. Though he excels in his capacity as a leader, he lacks the evil to be as thoroughly hated as his colleagues. Any planet that has been under his command suffers a great deal less than they would in the hands of any other Darkfire commander. He is generally considered to be a kind and merciful ruler by the peoples he has occupied. His management style reflects his personality. A dossier compiled on him by Earth before the war began stated that he is "by far the most generous and compassionate member of the Darkfire high command" and "should a war with the Darkfire Empire occur, termination of the Emperor should be a high priority for the Earth forces, as the current Emperor would never consider any end to the war other than victory...Horatio is guaranteed to be more reasonable, and would almost certainly accept peace as a viable option to continuing struggle". Draconis spy reports state that in person he is "quite affable and charming...the polar opposite of his egomaniacal grandfather". Purdom was born in the Earth city of New York. Growing up in the crime ridden environment of a decaying urban area wasn't the best learning environment. Even so, Purdom eventually graduated first in his class from Princeton. After his graduation he was offered a chance to join the Navy, and went to the academy on Luna for pilot training. Graduating in the top 5 percent, Purdom was assigned to several Earth fleets in the Outer Colonies over his next few years in the service. Rising quickly through the ranks Purdom soon had his own squadron on the Supercarrier New York. When the war with the Darkfire started he was caught in the middle of the invasion, and had done quite well in the battle above Tau Epsilon. Purdom and the rest of his pilots left the briefing room and into the Supercarrier New York's fighter bays. After he strapped into his fighter the countdown reached zero, and the bay depressurized as the atmosphere was pumped out. External shields were lowered, and the fighters streamed out. As they made thier way towards the Darkfire Carrier Ruination, the pilots were all aware of the fact that no fighters showed up on any detection device. This wasn't the top thought in thier mind, they were busy dodging laser fire, but they all knew something was amiss. As they rounded the nearest Battleship they realized why they hadn't seen any Darkfire Fighters. They had been hiding behind the bigger capital ship, hundreds of them. Plasma fire from the Darkfire single ships lit the vacuum as Earth pilots did everything they could to evade the deadly weapons. The rest of the regiment, seeing that the squadron was in trouble, turned towards them and engaged the Darkfire Fighters as well. After some time of intense fighting most of the Darkfire ships had been destroyed, leaving only a squadron or so left. The rest of the regiment disengaged, leaving Purdom and his men to deal with the Darkies. He loosed a pair of anti-matter missiles at an equal number of fighters, and was rather pleased when they disintegrated. Seeing an opening, he fired all but one of his remaining anti-matter missiles at the Ruination, and watched as they ripped through the shield and impacted the hull of the ship. Seeing this opportunity, the New York fired a plasma beam at the damaged ship, cutting it neatly. The explosion when the beam reached the engine cores was nothing short of fantastic. Disheartened by the loss, the Darkfire troops were eliminated quickly. Now the ground war on Tau Epsilon could begin in earnest. When the ground war begins, Purdom will be up to his neck in Darkfire fighters and AA fire, but defeating the evil empire was more important to him than anything, and he was willing to do whatever it took to do it.